With the impressive HDH50s M-Audio align themselves with the likes of AKG and Sennheiser. Impressive bass extension. Generous frequency response range. Rugged, yet comfortable design. Bass extension might not be to all tastes. The words 'high definition' are usually associated with picture more than sound. Interestingly, the same period in audio's recent history has translated CD quality down to the smaller footprint of compressed formats, spearheaded by MP3 and AAC. With this in mind, M-Audio's badging of its HDH50 'High Definition Headphones' is potentially very smart - certainly a clever marketing move to borrow a term which adds gravitas from a parallel industry. But, what does high definition mean in practice and, more importantly, can a pair of headphones in AKG and Sennheiser price territory compete in performance terms? "The bass-end is certainly extremely rounded and deep, but they don't exaggerate bottom-end for its own sake"
M-Audio's use of high definition translates most readily to an impressive headline frequency response: the HDH50s promise a range from 12Hz to 24kHz, which is an extension comfortably beyond the range of most human beings' hearing at either end of the spectrum. The headphones are powered by 50mm drivers which can deliver an awful lot of volume. Solid components have been used for their construction too, with a steel and aluminium frame supporting the black leather ear cups and headband. Inevitably, there's some plastic to bind these elements together but no part of the HDH50s' construction feels cheap. In their box, you'll find a pouch containing connection cables, the main cable providing connection via either the left or right headphone, so that the cable can hang down the side of your choice. A 1/4-inch adaptor is also included. A second cable includes a microphone, which has mostly commercial-user appeal; if your smartphone listening is interrupted by a call, you can answer it without having to disconnect the HDH50s. All of which reads impressively but what are the HDH50s like when they're clamped to your head? Well, first and foremost, they're comfortable. The rugged construction could easily have equated to a slightly heavy, cumbersome feel in use but, while the HDH50s certainly feel reassuringly solid, they won't weigh you down. The closed-back design also isolates you nicely from the world outside and, although these aren't noise-cancelling headphones, someone will certainly have to make quite a lot of noise to intrude into your listening space when you're working with them. Most importantly though, their sound is impressive. 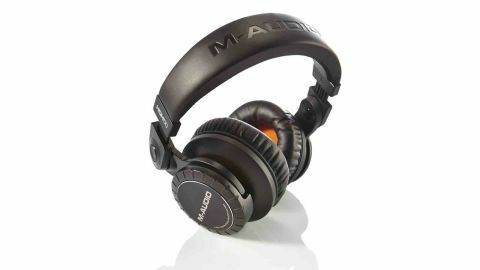 M-Audio make promises about these headphones removing the issues of 'ear fatigue' which, in practice, usually translates to two key frequency areas. Over-sharp upper mid-range and treble tire the ear quickly, while over-loud bass frequencies can be tolerated for longer but also soon wear out objective listening. Fortunately, the HDH50s do significantly reduce these issues; particularly at the top-end, while detail remains pleasingly transparent, M-Audio haven't incorporated the cheap trick of 'over-sweetness' into the sound here. The bass-end is certainly extremely rounded and deep - the 12Hz bass extension making its presence felt - but again, these aren't headphones which seek to exaggerate bottom-end for its own sake. What's most pleasing is the detail offered by listening to music with a wide dynamic range; even if your music snaps from a whisper to a bang across a bar line, these headphones respond very well to sharp changes of gear. They also offer both generous mix space and an impressively wide stereo field, rewarding bold pan positions at the mix stage, which isn't always the case, even with headphones at this price point. So, provided the solid bass extension isn't too much for your taste, there's no doubt that M-Audio has a solid performer on its hands here.